Climate Change Impacts on Mediterranean Ecosystems | Global Warming: Man or Myth? “Mediterranean ecosystems are among the most threatened on Earth. More than 41 percent of their land has been converted to farmland and urban uses. Worldwide, only 5 percent of their natural area is protected. Most people understand the plight of tropical rainforests, where habitat loss exceeds habitat protection by 2 to 1. In other words, for every acre of rainforest saved, two have been lost to conversion or development. In Mediterranean habitats, the disparity is much greater. For every acre of Mediterranean habitat saved, eight acres have been permanently lost” (Shaw, 2010).“By 2100, the Mediterranean biome is projected to experience the largest proportional loss of biodiversity of all terrestrial biomes due to its significant sensitivity to multiple biodiversity threats and interactions among these threats” (Klausmeyer and Shaw , 2009). Warmer and drier conditions will force species to shift. These shifts imply a need for migration rates that will exceed the ability of many of these species. Land use, habitat fragmentation and intense human pressures will further limit natural adaptation responses. Fires may threaten specific species and plant functional types. Vegetation structural change driven by dominant, common or invasive species may also threaten rare species. Overall, a loss of biodiversity and carbon sequestration services may result in many of these regions. Mediterranean climates are characterized by hot, dry summers and mild, wet winters. These regions cover only 2.2 percent of Earth’s land surface, yet they account for 20 percent of all known plant species. Only the tropical rainforests of the western hemisphere and southeast Asia have a greater density of plant species (Shaw, 2010). 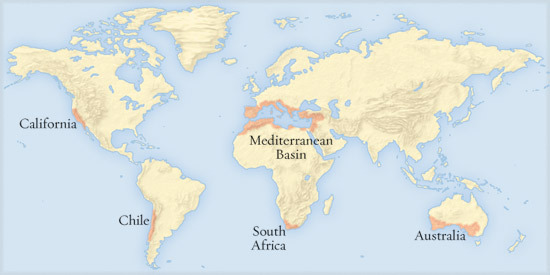 Mediterranean climates are found in only five places on Earth: California and northern Baja California, the basin of the Mediterranean Sea, southwestern Australia, the western cape of South Africa and the central coast of Chile as identified in the figure below. California ecosystems are expected to be impacted by any warming of 2oC or greater. Desert and grassland expansion at the expense of shrublands, and mixed deciduous forest expansion at the expense of evergreen conifer forest are likely. Between 60 and 80% of current species are projected not to persist in the southern European Mediterranean region if the global mean temperature increases 1.8°C. Less rainfall is projected for some Mediterranean regions which will exacerbate drought conditions. These conditions have already been observed in the eastern Mediterranean. Greater fire frequencies are likely the in Mediterranean Basin regions under a warmer and drier climate. Double CO2 climate scenarios increase wildfire events by 40-50% in California causing vegetation structural change in California (needle-leaved to broad-leaved trees, trees to grasses) and reducing productivity and carbon sequestration. Any carbon fertilization due to rising atmospheric CO2 appears unlikely to have a major impact in Mediterranean ecosystems over the next decades, especially because of consistent projections of reduced rainfall. Range size reductions increase species’ extinction risks, with up to 30 to 40% facing increased extinction probabilities beyond the year 2050. According to Klausmeyer and Shaw (2009) modeling of Mediterranean ecosystems by other researchers shows that in California, 66% of the plant species will experience >80% range reductions within this century and there is a projected 51–65% reduction in the mediterranean biome in South Africa by 2050. However, the authors concluded that the models used in these studies were limited due to their use of just one or a few atmosphere-ocean general circulation models (AOGCMs). For a better understand of future climate change impacts, Klausmeyer and Shaw undertook a biome-level analysis of global climate change using all 23 AOGCMs analyzed in the IPCC Fourth Assessment Report (2007). Their analysis focused on the mediterranean climate extent (MCE) across all five regions based solely on climatic factors. Relative size of the projected future (2070–2099) to the current (1960–1989) MCE. As the figures above show, the MCE is expected to expand globally but not uniformly. The Mediterranean Basin and the Chile/Argentina regions are expected to have a large increase in the MCE while South Africa and Australia are projected to have fairly large contractions of their MCEs. This analysis shows that climate change puts areas with the some of the highest levels of plant diversity on the Earth at risk. The Mediterranean Basin, Morocco and Israel contain large areas of projected contraction with no adjacent areas of expansion. The mediterranean portions of Morocco contain almost 13 plant species per 1000 km2, while Israel contains 200. The cape region in South Africa and southwest Australia are the other two regions with large projected losses, and they contain 95.5 and 71 plant species per 1000 km2, respectively. For comparison, there is 1 plant species/1000 km2 in Europe, 6.5 in Brazil, and 40 in Columbia. The current MCE in these four threatened countries contain 22,400 plants species, 12,925 of which are found nowhere else (Ibid). Climate change has already influenced the wine-making industry with a corresponding threat to Mediterranean ecosystems. Climate impacts everything from harvest quality and quantity to whether a vineyard can produce whites or red varieties. Because of the warmer climate, vineyards are being moved to higher elevations or to cooler coastlines. These regions are home to the Mediterranean ecosystems. For example, in Mendocino County, California, people are clearcutting to plant new pinot noir species at the expense of the natural species. This trend is likely to continue under a warming climate where vineyards can be physically moved but the native species cannot (Lalasz, 2010). Giannakopoulos, et al. (2009) modeled climatic changes over the Mediterranean basin for the years 2031–2060, where a 2 °C global warming is most likely to occur The authors investigated climate change impacts on human activities and natural ecosystems. One such impact modeled was fire frequency. The Canadian Fire Weather Index (FWI) was used because it is one of the most widely used indices of fire risk. The FWI consists of six components that account for the effects of fuel moisture and wind on fire behavior. These include numeric ratings of the moisture content of litter and other fine fuels, the average moisture content of loosely compacted organic layers of moderate depth, and the average moisture content of deep, compact organic layers. The remaining components are fire behavior indices, which represent the rate of fire spread, the fuel available for combustion, and the frontal fire intensity; their values rise as the fire danger increases. Fire risk is low for FWI<15, and increases more rapidly with FWI>15. A threshold of FWI>30 was selected as a measure of extreme fire risk. 2–6 additional weeks of fire risk (i.e. more than a month) over all land areas. A significant proportion of this increase in fire risk is actually extreme fire risk (FWI>30). South of France, and coastal areas of the rest of Mediterranean Region: significant increase in the number of days with fire risk (1–4 weeks), but not in the number of extreme fire risk. California Mediterranean ecosystems will also be impacted by fire. Westerling and Bryant (2007) modeled wildfire risks for California under four climatic change scenarios. GFDL and PCM global climate models and the A2 and B1 emission scenarios were compared for 2005–2034, 2035–2064, and 2070–2099 against a modeled 1961–1990 reference period in California and neighboring states. Their results appear in the figures below and show that under either emission scenario, wildfires increase but there is a much more substantial increase under the A2 scenario. Wildfires are not the only hazard for California’s ecosystems. According to Trumble and Butler (2009), “the elevated carbon dioxide concentrations and increasing temperatures associated with climate change will have substantial impacts on plant-insect interactions, integrated pest management programs and the movement of nonnative insect species into California. Natural ecosystems will also be affected by the expected changes in insect diversity. Many insects will alter how much they eat in response to changing plant nutrition. Also, we can expect increased problems with many pest insects as they develop more rapidly in response to rising temperatures.” The table below (Ibid) shows examples of how increasing atmospheric carbon dioxide affects plant-insect interactions. Many plants have two types of chemical defenses that reduce or stop insect feeding. One group of common plant defenses is nitrogen-based compounds (such as alkaloids and cyanogenic glycosides) that either act as toxins and kill the insects or act as repellents and make the plants unpalatable. In natural ecosystems that have limited nitrogen availability, plants may have lower levels of nitrogen-based toxins and so be subject to greater insect damage (Ibid). 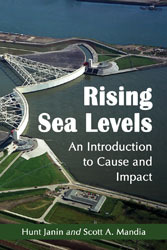 What effects will sea level rise have in the Med? Obviously Venice and a lot of the Nile delta are toast with any significant rise. Port cities – Marseille, Naples, Beirut and dozens if not hundreds of others would clearly have problems. Malta would fare poorly – it produces only 20% of its own food now, don’t know much about Cyprus or the other islands. IOW, millions of people, billions of $$ in assets, uncounted mountains of food production, all in dire straits. I assume you saw this recent study that suggests the Med is likely to face significantly worse drought in future? Mandia: Yes I did. In fact, last night I added that information to my Freshwater Resources Impact page that is offline. All of these impact pages, when done, will be hosted on my Global Warming Man or Myth Website. On that site, the pages will be more fluid than on this blog. As of now the pages are offline because I am still working on them. Tonight I may begin the Mountain Ecosystems Impact page. Excellent – thanks for putting these together. They are very useful. Another good post Scott – and one that is really close to home for me. The thing with the area around Perth (the south western tip of Aust) is that, due to its isolation, being surrounded in every direction by desert and ocean, its is a biodiversity hotspot with an incredible array of endemic species. I’ve only come to be aware of a few marsupials and eucalypts from this region, but if you’re only looking at the fruit and flowers of the gums, it’s a really interesting field. One of the members of our group, working for CSIRO, has been modelling what will happen in the Eyre Peninsular (the southward spike on the eastern side of the Great Aust bight). Basically, species are expected to move to higher latitudes – funnelling them into a smaller region (and one with large farming plots). Invasive species success cannot be understated. For my region, the Adelaide plains and Lofty region, olive, fennel and bridal creeper all are significant weeds from similar climates (ok, maybe only I really appreciate the concern over fennel at this point). There is little doubt that they will exploit native environments increasingly impacted by changing climate. I heard that California has a problem with introduced eucalypts? These plants provide excellent fuel loading for bushfire and are well adapted to bushfire prone areas (many have lignotubers which mean that almost all exposed vegetation can be destroyed and it can still recover easily). Basically, controlling the weed gums in California would go a long way to managing fire potential. Homes, trees, anything at all. Tim and I are quite accustomed to seeing the strange aftereffects of bushfires. We’re told how to protect homes and all the rest of it, but when you see most houses and trees burn in a street and indistinguishable others left standing more or less unscathed you’re often mystified. I know researchers here in Oz look at these things. But the best way to not get burned out is not to be in the path of fire at all. The threat of global warming will impact on the Western Cape of South Africa by increasing the likely hood of bushfires in summer, reducing the amount of indigenous Fynbos, and changing the wine industry due to sugar content in the berries at the time of harvest. The trick is to access what the positive aspects are and adapt to capitalise on them, while reducing risk exposure to potential damages be they in agriculture or nature conservation. We had some serious bushfire in summer 2009 and these can be expected again this year. The greatest incidence of fire department callouts is to respond to bushfires which could be prevented if people don’t throw burning ciggarette buts out of vechiles while traveling. Excellent post. As with Tim above, this hits home, as I live in Southern California and far enough inland that native vegetation still defines the surrounding areas. I have been noticing, especially this year, changes in the vegetation. Some changes I link to recent devastating fires and others that look like grasses starting to become prominent for the first time among bushes (chaparral). Another change from bush to grass I link to a fire that was was followed by ten years of drought. There’s another factor at work that may need more mention. The terrain rugged, resulting in north and south slopes with very different vegetation. A fire wipes out one slope, and this works like a rachet that gradually increases the disturbed range while not allowing regrowth since it’s not directly connected to the nearest similar vegetation. I wish I know how to separate normal variability from what I’m seeing. I should like to point out that the increased fire frequency in California is not solely due to dryer conditions. Introduced grasses from other similar climates have nearly out competed all of our native bunch grasses which stayed green longer during the dry season and were very fire resistant. Also, not all Mediterranean climates have hot summers. Some coastal areas in this climate have a modified climate with COOL and HUMID summers. Redwood trees couldn’t survive in a regular Mediterranean climate but get their water from summer fog and the water loss is reduced in the cool humid summers. Another thing to note is that California this past summer had one of the coldest summers in over sixty years. I have observed in California during this unusually cool and foggy summer that plants that normally live in moist areas have started to move to the dryer spots where fog drip had become regular, unlike in the past. Lastly let me tell you that I believe in Climate Change. I believe that our world changes and fluctuates it’s temperatures all the time and scaring people to think the world is going to become Mars in 2099 is unfair and deceitful.